After conducting a detailed study of more than 295,259 online jobs, Freelancer.com (one of the world’s largest freelancing and crowdsourcing marketplaces) has released a list of 50 fastest moving jobs and trends affecting entrepreneurs. A peep into them will help online professionals and businesses re-analyze their marketing strategies and know where and how they should invest their resources to get the best yields from their input. For those who have not heard about Freelancer.com, this huge freelancing site has over 13.6 million registered users who have posted 6.6 million projects and contests to date in over 700 areas as diverse as website development, logo design, marketing, copywriting, astrophysics, aerospace engineering and manufacturing. The fastest growth has been seen on Pinterest. Once rubbished away and dismissed as a scrapbooking site for school going sites, it now has 70 million users. Though that is tiny when compared to the 1.32 billion strong user base of Facebook, what makes Pinterest stand apart from other social networking sites is the fact that 80% of its users are women and an average Pinterest user spends nearly 98 minutes on the site every month. That makes it a hot target for advertisers since women affect a larger percentage of purchases than men. The site is finally making a move towards monetization with the expansion of promoted pins. Though Google plus has also risen sharply by 532% from 269 jobs to 1699 jobs, it pales when compared with Pinterest. 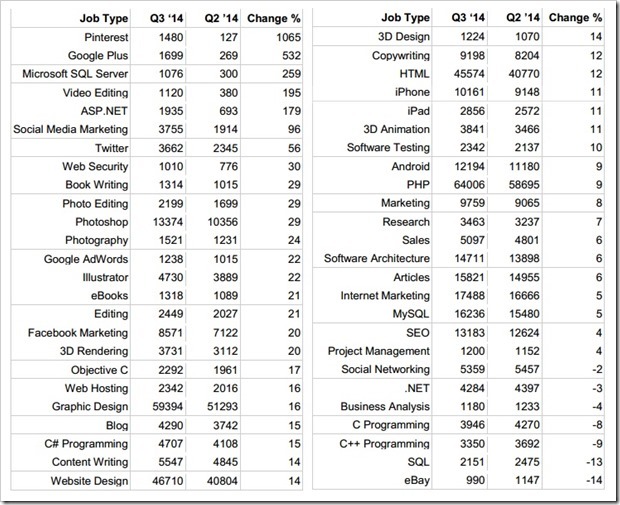 Jobs on Google Adwords platform have also risen by 22% to 1238 jobs. Social media in general has had an exceptionally good quarter, with social Media Marketing jobs having risen by 96% to 3755, Twitter up 56% to 3662 jobs, Facebook Marketing up 20% to 8571 jobs, says the report. The general trend towards visual, engaging and original content has driven strong growth in the visual design arena, with Photography up 24% to 1521 jobs, Photo Editing up 29% to 2199 jobs, Photoshop up 29% to 13374 jobs and Illustrator projects are up 22% to 4730 jobs. 3D content is also continuing to feature, with 3D rendering up 20% and 3D Design up 14% to 3731 and 1224 jobs respectively. Google’s continued efforts to reward original and quality content has also led to a huge surge in the demand for jobs in the content related market. As a result of that, “book Writing is up 30% to 1314 jobs, Photography is up 24% to 1521 jobs, eBooks are up 21% to 1318 jobs, Editing is up 21% to 244 jobs and Blogging is up 15% to 4290 jobs. People are caring more about what gets published versus just reposting and scraping content. This means a better and more engaging experience for all. Android, which had been dominating the smartphone market for seven consecutive quarters, got a hysterical response to its newly launched iPhone 6 and their first attempts to enter the phablet arena with the introduction iPhone 6 plus which comes with a bigger screen. Investor confidence in Apple and iOS being restored has led to . Increase in iPhone and iPad development related jobs: and While Apple’s market share had fallen from 13% to 11.7% during the April- June 2014 period, Android had ruled the market with an 85% share. In this quarter, however, both iPhone and iPad development are up by over 11% to 10161 jobs and 2856 jobs respectively, and Android is up 9.1%. A clear indicator of things to come! Microsoft resurgence: This Bill Gates owned company also looks all set for resurgence. Both SQL Server and ASP.net are up by 259% and 179% to 1076 and 1935 jobs respectively. Freelancer wonders if this has been brought about by Satya Nadella taking over as the CEO. Has he infused fresh life into the company? The most notable omissions from this list, according to Freelancer, have been Alibaba and eBay. This list will give millions of people an idea on which online jobs are the hottest, most trending and highly sought after- a valuable knowledge for users whose passion and craft fit the job trend, for users wanting to expand their skills, and also perfect for millennials seeking to create a positive impact by helping startup businesses of today. Is This HP #Bendtherules Ad Inspired By Lenovo? Same Entrepreneur, Same Story With Different Laptops!